Sadly Desert Orchid passed away peacefully at his stables in Newmarket on the 13th of November 2006 aged 27 years. Desert Orchid's first season started in an unspectacular fashion. Few who saw him on his debut thought they were watching one of racing's superstars. In fact when he fell at the first in a novice hurdle at Kempton in 1983, it seemed that his first race may be his last, as he took along time to get to his feet after a heavy fall. He finished his first season still a maiden. Desert Orchid started the 1983/4 season on a winning note, at Ascot where he beat Lucky Rascal by 20 lengths. In this season he won 6 of his 8 starts, his final race of the season being an unplaced effort behind Dawn Run in the 1984 Champion Hurdle. He was no longer eligible for novice company over timber in 1984/5 and struggled to recapture his novice form. He won one of his eight starts this season at Sandown. Following this win he appeared to lose his form. He was pulled up in the Champion Hurdle at Cheltenham, the Welsh Champion Hurdle at Chepstow, and on his final outing of the season fell at Ascot. In 1985 Desert Orchid returned at Kempton and was sent off a 4/9 favourite. Again he failed to complete, falling 2 out when clear. Desert Orchid was then switched to the bigger obstacles, which proved the making of the grey. He ran up a sequence of four wins at Devon and Exeter, Sandown and Ascot (twice) before unseating at Ascot. He did not win again that season despite three further placed efforts. Dessie returned at Sandown in November 1986 with a victory over 2m 4f, but finished 4th out of 5 next time out at Ascot. Back at Ascot he won over 2 miles before returning to Kempton Park for the Boxing Day. Dessie ran out a spectacular 15 length winner over Door Latch in the King George VI Chase. This was Dessie's first win under Simon Sherwood. He followed up with wins at Sandown and Wincanton, before finishing third in the Queen Mother Champion Chase at Cheltenham. He bounced back to Win over 2m 4f at Ascot before being pulled up in the Whitbread on his final outing of the 1986/7 season. Wincanton was the scene of Dessie's 1987 reappearance, winning over 2m5f before a victory at Kempton. A string of places followed, second at Sandown (2m), before a second in the 1987 King George, and places at Sandown, wincanton and Cheltenham (Queen Mother Champion Chase to Peralyman again). He got his head in front on his last two starts of the 1987/8 season taking the Martell Cup at Liverpool and the Whitbread Gold Cup at Sandown, ridden by Simon Sherwood. The South West Pattern Chase at Wincanton saw Dessie return in 1988 with a victory, and the grey went on to take the Tingle Creek Chase at Sandown, before his second King George at Kempton on Boxing Day 1988. Dessie then took the Victor Chandler at Ascot and the Gainsborough Chase at Sandown. However, his finest hour was till to come. This time he was stepped up to 3m 2f for the Cheltenham Gold Cup, he had previously been considered a two-miler and tackled the Champion Chase. The rain and snow had fallen relentlessly at Cheltenham on Gold Cup day made the racecourse going heavy. These were conditions hardly suited to Desert Orchid, especially at this left-handed course which he never particularly favoured. However, his trainer David Elsworth was determined to run him. A crowd of over 58,000 witnessed Desert Orchid's immense effort to overhaul the mud-loving Yahoo in the final stages of the race. After his one and a half length victory, Desert Orchid's rider, Simon Sherwood said: "I've never known a horse so brave. He hated every step of the way in the ground and dug as deep as he could possibly go". Three cheers were called as Desert Orchid was unsaddled, surrounded by thousands of approving fans. The nation's favourite steeplechaser had not let them down. In 1989 Dessie again returned at Wincanton with victory. After a second in the Tingle Creek, he headed for Kempton and his annual Boxing Day outing, where he took his third King George, this time as the 4/6 favourite. He followed up with a win at Wincanton and then took the Racing Post Chase at Kempton. A third in the Cheltenham Gold Cup preceded Desert Orchid's convincing win in the Irish Grand National at Fairyhouse. He was given top weight of 12 stone to slog round Fairyhouse, but sent off the even money favourite he slammed Barney Burnett by twelve lengths conceding 2 stone. As a competitor his presence is missed. Desert Orchid's breathtaking jumps were one of the most compelling sights in racing. 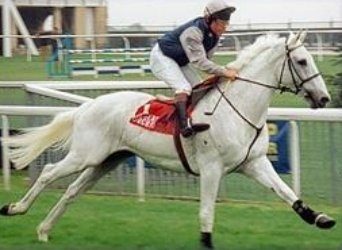 Desert Orchid won 34 of his 70 starts, amassing £654,066 in prizemoney. Since his retirement Dessie has raised thousands of pounds for charity, and his mere presence at charity events brings the public in their droves. Desert Orchid is a legend in his own lifetime.